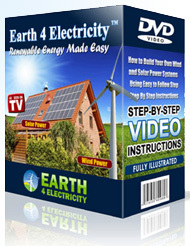 Build it Yourself Wind Generator: Pain or GAIN? Grid power is becoming more and more expensive everyday, making people look for alternative energy for home use. As for alternative renewable energy, wind and solar power are readily available in our small planet merely for the asking. But while the wind blows all the time at varying forces, solar power goes to sleep as soon as the sun sets for the day. And since wind sweeps all through the day and night, it is harnessed in an uncomplicated way to generate electricity for our daily use. The generators that produce electricity through wind power are called wind turbines or for simplicity’s sake, just Turbines. Although wind generators or turbines are readily available for sale at a fairly high price all over the country, technically minded people enjoy building their own wind generators at home at an incredibly low price. To be honest about it, building yourself a wind generator for the home needs the following parts, most of which can be fished out of the local hardware store almost for a song. An electronic control system that can switch the generated power from the batteries to a dummy load or redirect the current to a grid. But do not, for a moment, nurture the idea that all motors will follow the textbook formula, producing the anticipated power when spinning at rated rpm. So, here comes the question of pick and choose. If you go by the thumb rule, select one that is sleek and less heavy as compared to others. The motor selection completed, you may turn your attention to the blades. They may be carved out of wood (too heavy) or sawed out of a 6 inch ABS pipe that is at least 24 inches long. When cut lengthwise into 4 pieces, they make excellent blades for the wind powered generator. In fact, the generator will need 3 blades while the fourth one will serve as a spare blade for replacement when any one gets accidentally damaged. For a person involved in ‘build it yourself wind generator’, the next step is to go search for a hub to which the blades are to be hatched. One more trip to the hardware store may solve the problem instantaneously. Once located, it is literally a breeze to bolt the blades to the hub and then fixing the assembly to the shaft of the motor. As soon as it is done to the builder’s satisfaction, a mounting frame for the wind turbine generator is needed. This can be comfortably achieved by fixing the assembly onto a piece of wood measuring 4” x 2” And since the contraption also needs a tail end to keep it keep it turned into the wind all the while, use a piece of aluminum sheet to do the job efficiently. After all the hardware job is completed, a wind turbine charge controller is needed which will monitor the voltage of the batteries in the system. It will either send power from the generator to the batteries or divert it to other sundry loads to save the batteries from over-charging. Alternatively, it can also direct the current to the utility for making money. These minor electronic items are, however, always available at e-bay at a nominal cost. Now that the unit is fit for operation, one needs the tower to hoist it up into the wind. All one needs for this piece of job is a 10 foot long 1.25 inch conduit and some guy ropes. The rope will anchor the conduit to four wooden stakes driven in the ground while the turnbuckles on the lower end of each guy-line will allow plumbing of the tower. Now one could raise or lower the tower by releasing the line from either stake in line with the pivot fixed at the base. Apart from the fact that a build it yourself wind generator can be amazingly cheap for the average citizen, the satisfaction of building one far outweighs the cost factor. In fact, doing anything constructive has its rewards that often can not be realized by dollars alone. Building a wind generator is quite easy really – you just need to know the details. Given the many advantages of wind power that range from ecological to financial, it makes a lot of sense too to get wind power for your home or commercial establishment. To make it fully functional, you should also know where to buy cheap parts from, learn about how to choose the best location and how to wire the system. And of course you should know about the safety precautions.